KarateForums.com - 10 Years as a Staff Member for tallgeese! Posted: Sun Dec 02, 2018 1:05 am Post subject: 10 Years as a Staff Member for tallgeese! December 2 marks 10 years that Alex (tallgeese) has been a member of our staff at KarateForums.com. There are many cool things about Alex, and I'd like to talk about a few of them today. First, let's start with his contributions to KarateForums.com. He's up to exactly 6,800 posts now and there's a lot of wisdom there. I read a lot of posts, obviously, and we have so many posts that contain insightful martial arts wisdom. But there is something about Alex's posts that, even as a non-martial artist, I enjoy reading them. 2. An ability to communicate that knowledge in a way that isn't self-serving. 3. A friendliness that encourages a response. 4. The opening for others to respond and, as such, the opening for growth, where his posts don't read as someone trying to be end the conversation or be definitive. 5. Comprehension of the posts he's responding to. His posts are just really outstanding. Next, I'd like to discuss Alex's contributions as a staff member. He's a really outstanding moderator. To become one of those, you really have to want to be one. It's easy to be a bad one, to try to moderate as an individual and apply guidelines in your own way, to miss details, to be sloppy. But Alex is a really strong moderator. His law enforcement background helps, but what also helps is that he cares. And it shows. A lack of caring leads to inconsistent decisions and cutting corners. Alex doesn't do that. Finally, I'd like to highlight his journey since registering here in May of 2008. He touched on this recently, and I'd love for Alex to expand on that a bit here to refresh our memories, but he's really come a long way as a martial artist, especially in BJJ. Specifically, it's been amazing to watch him grow to the point where he felt comfortable to start his own school, Alpha BJJ, which has become a focal point in his life. That school didn't exist when he joined, and now it does. Alex, thank you for your consistent, meaningful contributions to our community, as a member through your posts and on staff. Thank you for all of your support over the years, and for really believing in this community. I feel fortunate to have you. Please join me in recognizing Alex, in honor of this milestone, with a reply to this thread! 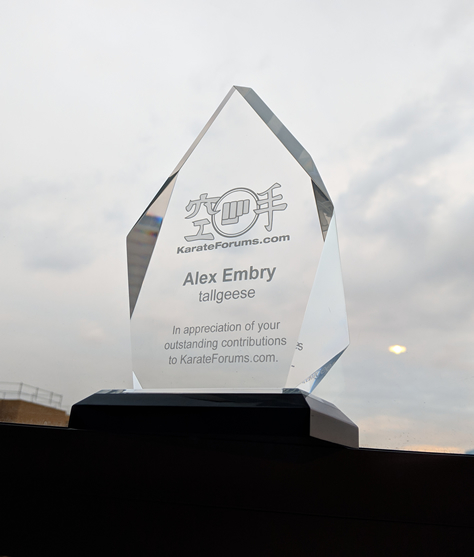 Congratulations, Alex, for reaching this near unparalleled KF Milestone!! What Patrick has posted in his OP is the exclamation point in what you've contributed and achieved here at KF unselfishly these many, many years. The respect I have for you, Alex, is immeasurable beyond words. Your unwavering devotion towards your family, friends, students, community, KF, the MA, as well as your law enforcement career, are incontestable. The last KF LiveStream was, imho, one of your most definable moments. The manner of ease in which you handled each and every aspect throughout that event was seamless; with your engaging personality, no matter the topic. You've an penetrating intellect that's most inviting, which allows one to learn and relax in a welcoming atmosphere. Your professionalism is without any ambiguity whatsoever; in that, you've never expressed an outwardly judgment towards anyone here at KF. You've mentored more here at KF than you might be ever willing to accept. However, as one here that can emphatically proclaim most sincerely just how much your mentoring means to me; I greatly appreciate your mentoring me all these many years. Here's to another 10 years, God willing!! Congratulations on the milestone, and thank you for everything you do here. Karateforums is a far better place because of everything you do. Congrats, and thank you for your service! Thank you so much for all the kind words, everyone. It is humbling to have members of this group chime in on this thread. Patrick, it is just great to be here and be able to help, in some small way, to the function of this community you've built. I really am at a loss for words. Thank you all. Congratulations, Alex, on this great milestone! You've always been a great contributor, and became an even greater moderator. Keep knockin' it out of the park, Alex! Congrats Tallgeese, I bet that 10 years has flown!!!! !